← Idlewild’s HALLOWBOO: A Pittsburgh Fall MUST! Disclaimer: I was provided with information about Myrtle Beach’s Hollywood Wax Museum through US Family Guide in order to write this post. All opinions are 100% my own. If you love to travel with family, I’m willing to bet that Myrtle Beach is on your list. My husband grew up there, we met there, Arianna was born there…so while it holds a special place in our hearts, we truly love vacationing there too. The Hollywood Wax Museum Entertainment Center is the best value in Myrtle Beach, South Carolina. When was the last time you walked the red carpet with an A-List star or stepped into the spotlight with Hollywood royalty? At the Hollywood Wax Museum, you’ll get the chance to pose with your favorites while learning about their pets, pet peeves and accomplishments. Bring your adoring fans (friends & family) for fun photo ops! Are You the Chosen One? Find your way through the hidden corridors and save Princess Hannah in Hannah’s Maze of Mirrors. You’ll need to make your way through 288 potential turns among hundreds of mirrored walls and archways while enjoying other surprises along the way. It’s a modern-day fairy tale, where you’ll get lost and come out smiling! And finally, in Outbreak, you must stop a worldwide viral attack. Chemacorp might mean well with Alpha Strain, but the gene-altering substance turns humans into zombies. Shriek your way through the ransacked lab and rotting basement where zombie infection is rampant and aerosol attacks are unpredictable. Contain your fear? No way! 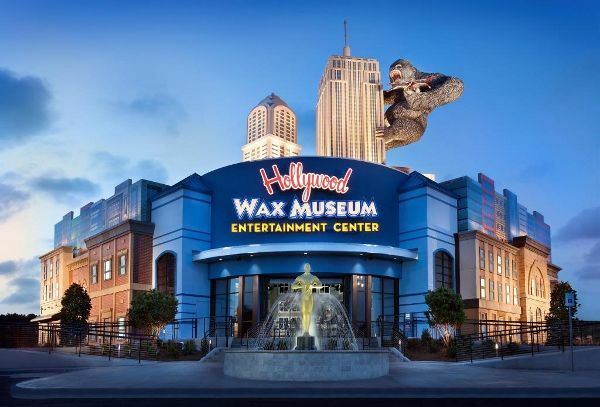 My Readers receive $2 OFF ALL ACCESS PASS at the Myrtle Beach Hollywood Wax Museum Entertainment Center when purchased here. Have you ever experienced this entertainment center? What did you think? I’m excited to snap a few pictures with my favorite celebs like The Rock…I think I’ll need my latest Half Marathon medal on me though, right? This entry was posted in Travel and tagged Myrtle Beach, us family guide. Bookmark the permalink.